This morning I was scrolling through my Twitter feed when I saw a horoscope that a friend had posted. The first sentence was: “You have recently experienced a phase of expansionism, and it’s time to regain balance in your life.” While I understand that horoscopes are essentially written so that all of us can say, “Oh wow, that’s totally me”, the word expansionism made my inner Self react. 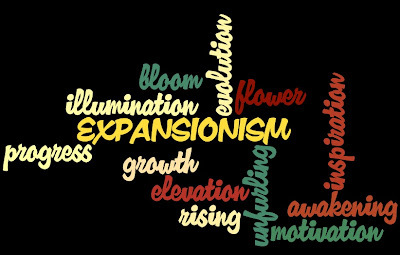 While it’s a lengthy word which essentially means growth, it also brings visions of other, more applicable terms for its personal meaning. You can make your own Wordle! 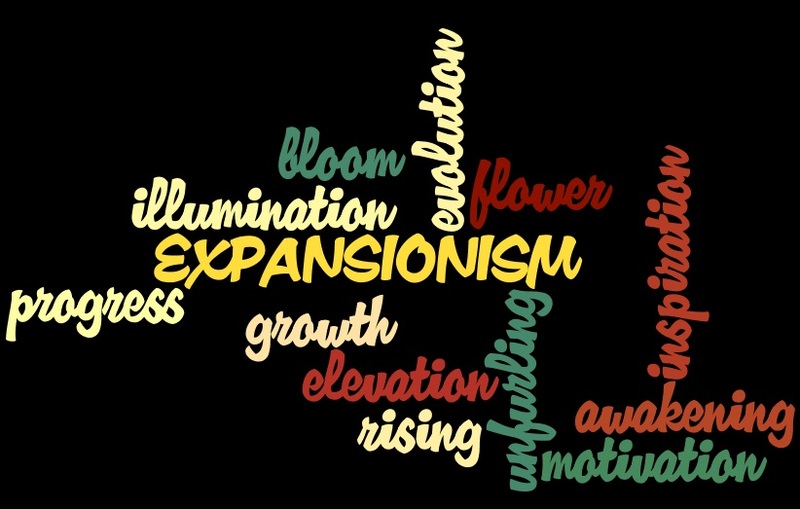 “Expansionism” makes me feel energetically enormous all while wanting to wrap my arms around myself. There is a little bit of fear poking her head out from behind a chair, because it’s so all-encompassing to allow yourself to expand in every way imaginable. What will happen when you take a step over your comfort zone? As it turns out, wonderful things can occur! This year I will have a theme based on three words: Journey. Discovery. Self. Expansionism fits perfectly as a subcategory under Journey. It’s the personal allowance which leads to the awakening, the growth, and the illumination of discovery. If we live in our absolute comfort zone, how are we to experience the unknown? Yes, it’s scary to knock on those doors, but the more we do that, the more our lives are affected by possibilities and wonder. I used to be painfully shy – so much so that the idea of picking up the phone to call someone was terrifying. I also battled agoraphobia for over a year – where leaving the house was enough to bring on horrific panic attacks. I had to take that first step, or else I would die in that apartment! After the first few steps, it became easier. I felt my feathers growing back. I constantly push myself to meet challenges; writing publicly about these things is healing and invigorating all at once. How can you challenge yourself this year to expand? What will make your soul sing and your wings unfurl in anticipation and excitement? I would love to hear about the challenges that you are setting for yourself! I love it! I tend to give up too easy when there is something I want to accomplish. This year is all about not giving up for me! Great word! I will spare you the horrible cheerleading dance moves, but want to say GO STACEY!!! Let's do this! Good for you for overcoming major obstacles! 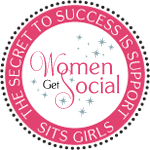 I saw your post on SITS and read that you are a new blogger. Me too! Good luck to you!! Overcoming obstacles is a daily process for all of us, I think - it just matters how big those challenges are. All the best to you! Heading over to your site now! Wow. I love your post. I'm visiting from SITS after you wrote on my site on my SITS Day. Congrats on making the steps to control or defeat your agoraphobia. I love the journey world. I have a sign in the kitchen that says Enjoy the journey. I will be back to visit. It's a big word in every sense of the way, and it's so good to see that you're embracing it. It was a fight, but I have won over the agoraphobia and panic, and have been blessed in life with friends and family who stood by me. I look forward to reading your book, and plan to start tonight! Congratulations! Hello, Alison! Thank you so much for your comment and visit. :) It's a freedom to embrace your passion, isn't it? I look forward to this next year, and staying up with your awesome insights! Beautiful choices. I love this. I choose one word for the idea. This year my word is "see." I want to slow down and see all the things I normally miss when I'm rushing. I want to be present in my life more. I want to notice moments. I want to see as God sees. I want to see life in all its technicolor glory! Best wishes for the new year. I hope it's everything you want it to be. There's absolutely Ann Kerr combined with Sherry Cole what quite first advocated working with power oven. The inside of their cookware find you get provisions dust, spluttered using a structure. 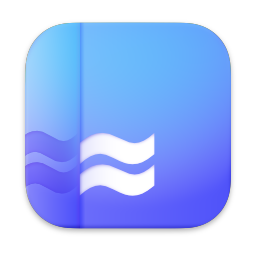 Unquestionably the so-called internet privacy cup independently windows operating system is certainly not misnamed: as a way to get a style insider's it web . right up from the home window.